At Normal Incidence & Upto 45 ℃ from Normal: Min. reflection loss (angle of incidence equals angle of reflection) w.r.t metal plate of same size shall be -15dB at 5.0 GHz, rising to min. -17 dB at 8.0 GHz and min. -20 dB at 10.0 GHz and higher frequencies in both polarizations. At 60 ℃ From Normal: The reflection loss is down by less than 5 dB w.r.t normal and upto 45 ℃ performance at all frequencies and in both polarizations. Under Wet Condition: Performance under wet condition remains practically unchanged w.r.t dry condition performance at all angles /polarizations /frequencies. Working Temperature: -50 ℃ to + 80 ℃ . Base Size: 300mm X 300mm. Weight: Approx.1.3 kg of 300mm X 300mm size sheet. Conical front side to face radiation to be absorbed. Color: Black for CRA-18, CRA-18-P is painted (as desired) version of CRA-18. Type of Paint: Polyurethane type suitable for outdoor (ship born) applications. Feature: Broadband, Conical, Weather proof, suitable for sea applications. Application: On ship borne mast and other out door applications, etc. Walk-able: CRA-18, CRA-18-P & CRA-18-P-M is rigid enough to be used on walk on areas. Frequency region: 5.0 GHz to 18.0 GHz and beyond. 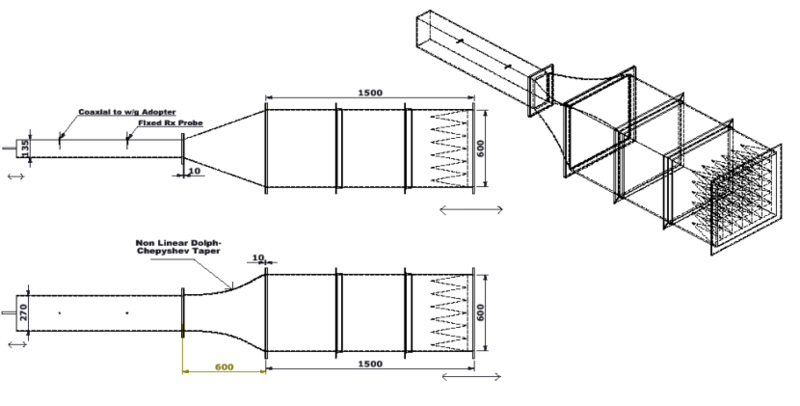 CRA-18-P is mainly used around RADAR and antenna. For radar signature management by covering the ship mast. To avoid the ground reflections at open area test sits (OATS). To eliminate interferences and unnecessary reflection. To avoid the cross talk between transmitter and receiver antenna. 15 dB at ± 5% band with around the center frequency (as compared to the flat metal plate of the same size) Tested as Per IEEE Std.1128/1998: IEEE Recommended practice for RF Absorber Evaluation using NRL Arch Method. RA is a Thin, Flexible, Weatherproof, Resonating Rubber based Microwave Absorbers. Design frequency range is of 1 GHz to 18 GHz. Highly reliable and stable as an outdoor RADAR Absorbent Material. Suitable for Narrow Frequency Band Operations. Available with a metal backing in 300 mm x 300mm size. Unlike typical iron-filled rubber absorbers, no oxidation is possible due to the chemical nature of the filler component. Can be readily cut with a sharp knife and template and conforms to mild curvatures. Highly flexible for easy processing and installation. Consists of Magnetically/Electrically loaded Neoprene (RA-N) and Nitrile rubbers (RA-NL). Adhered to masts of Ships, walls, bridges etc to reduce false images, reflections and echoes to nearby antennas. Suppressing parabolic antenna side lobes. Attaching to vehicles to reduce overall Radar Signature. Suppressing specular reflections inside microwave units e.g. power amplifiers of mobile telephones, low noise blocks of satellite receivers etc. Volume Resistivity: <0.1 (Ω*cm) tested per testing standard MIL-DTL-83528C. Size: Can be supplied given in desired size. Other Products: Other customized molded/extruded products can be made. Product Name: Conductive O Ring. Minimum reflection loss with respect to metal plate at near normal incidence shall be -10dB at 0.8 GHz, rising to min. -15 dB at 2.0 GHz, further rising to -20 dB at 5.0 GHz to 18.0 GHz and higher frequencies. Weight: Approx.3.5 kg of 300mm X 300mm size sheet. Frequency region: 800 MHz to 12.0 GHz and beyond. Test Frequencies: 2GHz and higher Frequency. Wave Guide Test Set-up with Non linear Dolph-Chebyshev taper for Frequency 700MHz-1050MHz. Test Schedule: 4 Pieces are tested at a time. Equipment Used: Agilent VNA and Flared wave guide. Method Followed: Time Domain filtering used to filter unwanted signals. Thin, flexible, narrowband resonant absorber at 14.5 GHz. Magnetically loaded urethane rubber sheets offer increased abrasion resistance. Temperature withstands capability from -40 ℃ to + 90 ℃. Metallic Alloy and special ferrite powder loaded sheets. Improved guaranteed performance of min. -25 dB reflection loss with respect to metal at near normal incidence at 14.5 GHz. Gives Min.-10 dB between 12.0 GHz to 17.0 GHz. Typically covers the entire Ku Band. KV-RA-U-14.5-PSA is backed with a transfer type acrylic based adhesive of about 50 micron (0.05 mm) thickness. This retains the reflection/ frequency characteristics of the absorber. The PSA is supplied with liner which is removed and the sheet is glued to the metallic surface. For optimum performance the absorber must be immediately backed with metallic surface. If a metal surface is not available, the sheet MUST be fixed on a flat metal foil and then cover the structure or ask for a metal foil backed absorber named as KV-RA-U-14.5-PSA-ML. Standard Size of absorber is 300mm x 300mm x 1.5mm and weight is ~400 gm. Urethane Rubber based thin flexible magnetically loaded broadband surface current attenuating sheet. 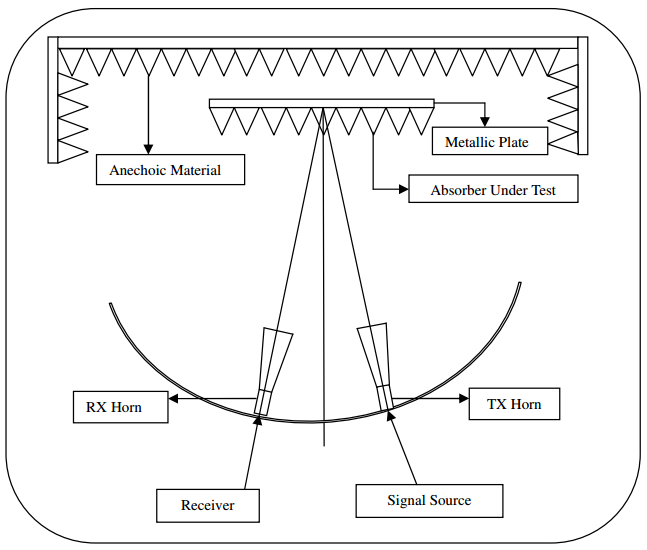 KV-SCA is used to attenuate surface currents from 1.0 GHz to millimeter wave wherever surface currents may occur, say in solid state microwave devices such as Amplifiers, Oscillator converters etc, reduction of RCS of Complex objects both by reducing specular reflection as well as surface currents etc. Attenuation shall vary from about 5.0 dB / cm at 1.0 GHz to 50.0 dB / cm at 10.0 GHz rising up to 90.0 dB/cm at 18.0 GHz. 300 mm X 300 mm X 1.5 mm sized sheet weighs approximately 650 gm. Density of sheet is approximately 5.0 gm / cc. Ask for detailed instruction for use and the adhesives. Attenuation shall vary from about 5.0 dB / cm at 1.0 GHz to 60.0 dB / cm at 10.0 GHz rising up to 90.0 dB/cm at 18.0 GHz. 300 mm X 300 mm other sizes may be supplied on request. Density of sheet is approximately 4.0 gm / cc. Adhesive to Metal: Thru a single component silicone adhesive with primer or through PSA adhesive affixed with the sheet. Synthetic Rubber with Magnetic Metal Flake Filler, termed as KV-SCA-SK-1. Reflection Loss with Respect to Metal at 1.0 GHz : ~ - 7.4 dB. This property is a function of thickness. Power Loss ( Ploss/ Pin ) at 1.0 GHz, 1.1 GHz and 1.2 GHz : 0.78, 0.80 and 0.84 respectively as calculated by finding S11 and S21 parameters in a WR-770 based waveguide set up using a VNA . We used time gating to find S11 in the waveguide. Power Loss is a function of thickness. Typical Attenuation : 9.5 db/cm at 1.0 GHz , as calculated from the complex permittivity and complex permeability of the material. 150 mm X 150 mm, other sizes may be supplied on request. Density of sheet is approximately 3.8 gm / cc. Adhesive to Metal: We recommend Dow Corning 3140 adhesive and 1200 OS Primer for the purpose. Can be supplied with pressure sensitive Adhesive. Two parts Polyurethane/ Epoxy based magnetically loaded microwave absorbing paint. High magnetic loss coating to a metallic surface to attenuate surface currents/ waves. Part A is a resin filled with magnetic particles and Part B is an unfilled hardener. It can reduce Radar cross section of complex objects having discontinuities like joints, trailing edges, sharp contour etc. It can be used to selected parts of antennas to reduce side lobes. Color of coating is dark grey. Approx. 4.0 of the mixed cured system. Depending on end use it can be tailored between 3.6 to 4.6 gm/cm3. Thin able, spray able, brush able by using special solvent KV-SCA-P-PU-T. Minimum 20 dB/Cm and 63 dB/Cm at 3.0 GHz and 10.0 GHz respectively as insertion loss. The attenuation performance shall be tested by S21 parameter. Thoroughly mix Part A. Part B requires no mixing. For each 70 gm parts by weight of Part A add 1.0gm of Part B and mix it thoroughly. Add approx. 5 to 10 gm by weight solvent KV-SCA-P-PU-T. Single coating thickness can vary from 100 micron to 200 micron, less solvent give thicker single coating. To increase thickness apply additional coat when the earlier coat is partially cured. The system is room temperature curable in 24 hours. Honeycomb absorber is fabricated in poly carbonate based honeycomb core. It is light weight with high mechanical strength. Its power handling capacity is high. The honeycomb absorber can have a uniform coating to optimize insertion loss (FAS-12-UC and FAS-25-UC) or a graded coating to optimize reflection loss (FAS-12-HC and FAS-25-HC). Honeycomb absorbers are available in two thickness i.e. 0.5 inch and 1 inch namely FAS-12-HC and FAS-25-HC respectively. Standard size is 300 mm X 300 mm. Standard color of the sheet is black. Guaranteed effective frequency range is from 8GHz onwards. Honeycomb absorbers are used as "lossy" loads in spiral antennas and high power antenna couplers. Honeycomb absorbers are used with laminated skins to manufacture radar absorbing structural (RAS) panels and components conforming aerodynamic requirements. Honeycomb absorber should be immediately back the metal surface. The back surface of honeycomb absorber which needs to be pasted to metal will be marked with white cross sign. Guaranteed performance of Honeycomb absorbers are as follow.